The Panasonic Lumix DMC-FX90 attempts to bridge the gap between a compact camera's ability to capture quality prints and a smartphone's ability to share shots to a social network. 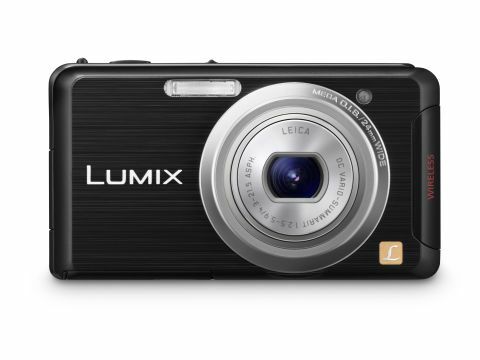 As a member of Panasonic's range of Lumix branded compacts, the FX90 shares many features and functions with the slightly cheaper Panasonic Lumix DMC-FX77, but has the added bonus of built-in Wi-Fi connectivity to enable you to send shots to your smartphone while out and about, then upload them to the web. You can also wirelessly link the Panasonic Lumix FX90 to your PC and upload the shots without having to connect the camera via USB or insert your SD card into a memory card slot. Priced at £269.99 in the UK, typical compact camera features are present and correct, including the usual Scene modes such as Portrait and Sport, although it's also packed with extra modes such as a well-designed Panorama Assist. This mode enables you to overlay the edge of one frame over the live view feed to help compose and capture the next shot in the panoramic sequence - although you'll need to stitch the shots together in an image editor. There's also an effective Handheld Night Shot mode, which blasts off a series of stills and then automatically combines them into one image to reduce noise and motion blur. In an effort to boost its list of functions, the Panasonic Lumix DMC-FX90 also has some superfluous shooting modes such as Food, which simply changes the white balance to suit the colour temperature of typical restaurant lighting. If you own a Panasonic 3D TV, such as the Panasonic TX-P50VT30B, the Panasonic Lumix DMC-FX90's 3D Photo Mode will be of interest, because it enables you to combine two offset shots into one stereophonic image, which it saves as an MPO format file. As a compact camera designed to appeal to the face-tagging generation, the Panasonic DMC-FX90 enables you to register friends' faces, so that the camera will prioritise focusing on those individuals in a group scene. As you pan or zoom, an Auto Focus box will latch onto a familiar face and even display their name on the camera's display. The face-tagging option is fairly hit and miss, since it won't always recognise your registered subjects. The AF tracking option is more useful. Tap on the screen over the object that you want to keep sharp and the camera will attempt to track it. This is useful if the object moves, or if you want to pan around to offset the subject for a more creative composition. Although it's a compact, the Panasonic Lumix FX90 enables you to shoot Full HD video footage at 1980 x 1080p, and save clips in the popular AVCHD or MP4 formats. The movie and still recording functions take full advantage of the camera's Mega O.I.S (optical image stabilisation) function to reduce camera-induced motion blur. This works by using gyros to keep the lens stable rather than by post-processing the shot.